Often we associate the richness of a person with his ultimate exploitation of poors in our society. 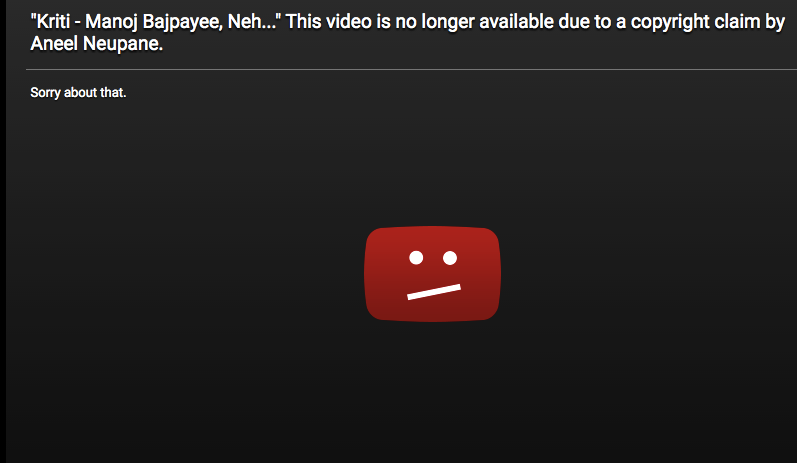 But YouTube has taken a decision which will shock the complete bollywood industry. Shirish Kunder’s production ‘Kriti’ has been taken down from social video website, YouTube at 11:00 PM IST. This is unique case where on being proved by the nepalese director Aneel Neupane and the proofs submitted by him actually worked. Kriti was praised by many movie critics along with Delhi Chief Minister Arvind Kejriwal and Aam Aadmi Party leader Kumar Vishwas openly on twitter. The story begins a week ago with the release of ‘Kriti’ movie. The exactly similar story was seen in Aneel’s low budget production ‘Bob’ which was released earlier. As Shirish hadn’t taken any consultation with the owner of Bob movie, Neupane claims on Facebook that it was his work and he was not able to do proper marketing because of lack of money. Many Indian Media houses India Today, Storypick, Scoopwhoop came along with the Nepalese man to raise his voice. According to Media reports on Monday, Shirish however, later issued a legal notice to the filmmaker for wrong claims. Shrish told in his notice that “unconditional written apology” should be given to him by the filmmaker. And he also stated that he had never seen any such video. -A psychiatrist is trying to help a young schizophrenic patient win over his imagination with some rather unconventional methods. BOB – A Short Film by Aneel Neupane from Aneel Neupane on Vimeo. People from Nepal and India had helped the filmmaker in reporting ‘Kriti’ video which had crossed 2.5 million likes on YouTube. As the matter is of international discipline, it would be interesting to see the very next action by the Honable court.